If you are looking for something interesting, fun and traditional to add to your St. Patrick’s Day celebrations, consider baking a loaf of Irish Barmbrack. I know what you’re thinking – I’d never heard of it either – but trust me, it’s delicious. As luck would have it, I stumbled upon this recipe just in time to bake a few loaves for St. Patrick’s Day. I spent the better part of last year making jams, preserves, candied citrus peels and marmalades. I have been searching for interesting recipes that incorporate some of my home made creations ever since. As you may imagine, there are very few recipes that actually call for preserves as an ingredient, as they are best smeared on slices of bread and biscuits baked on cold winter days. I was particularly excited to find that Barm Brack incorporates the preserves directly into the batter! The recipe provided below allows for several cups of dried fruit. I recommend currants (or raisins if you can't find any), chopped figs, cranberries, cherries and plums along with lemon or orange marmalade. So, enough about my preserves, let's talk about Barm Brack! This is a dense, lightly spiced, baked good containing dried fruits soaked in tea (or brandy, if you’re over 21 and adventurous), marmalade and hints of cinnamon and nutmeg in the batter. This ‘loaf’ falls pleasantly in between bread and cake - too sweet and dense to be considered bread, but too much like bread to be considered cake. It is traditionally baked in a round or bundt pan, sometimes the yeast version is baked in a bread pan, and some like the free-standing round loaf that you form with your hands on a cookie sheet. Whatever shape your family prefers their Barm Brack to be, it is known for being sliced, toasted and served with a healthy slab of butter. There are 2 ways to bake your Barm Brack - with yeast or without. I’ve included detailed recipes for both the quick bread and the yeast versions at the end of this blog for you to try at home. I recommend the quick bread recipe, as I prefer the taste and density of this version, although both recipes produce a yummy treat. 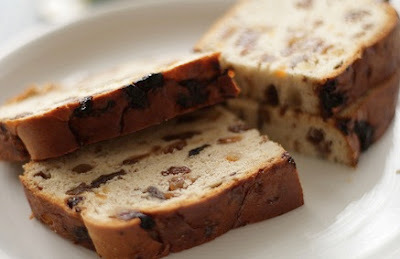 Barmbrak, also referred to as Barm Brack or Báirín Breac, can be translated directly from the Irish (Gaelic). Literally, it means speckled loaf: Báirín (loaf) Breac (speckled), thus named because when cut into slices, the exposed loaf is speckled with the fruit and candied rinds. Some say the fruit was purposely added as a distraction for the small fortune-telling items that were baked inside. The Matchstick: You'd be single. Originally, Barm Brack was baked specifically for Halloween celebrations. Small trinkets were wrapped in greaseproof paper (a wax paper-like material) and baked into the Barm Brack. Items included a pea, cloth, a ring, and even a small statue of the Catholic Virgin Mary. Party-goers would choose their piece and search their slice for one of the items inside, predicting their future for the next year. The Ring: You'd be wed that year! These days, it's most common to find just a ring baked into the Brack. See photos for the most traditionally known items and the fortunes they told. During the Halloween season in Ireland, packaged Barm Brack is still sold with the ring baked inside. During the rest of the year, it can usually be found (without the ring) at grocers and bakeries, as it remains a popular teatime cake in many Irish families. It’s also been known to make an appearance (with or without trinkets) at various other celebrations, festivals, family gatherings, and holiday parties... Saint Patrick’s Day included! The Cloth: Poverty for the year. The Coin: Riches for the year! If you would like to include the fortune telling items in your Barm Brack, you can collect them (dollar stores and party stores are the best), clean them and wrap them in wax paper. Instead of adding them to the batter, which is not really safe or sanitary, when the Barm Brack has been baked and is finished cooling, as you turn it out of the baking tin, push the wrapped items into the bottom, then set it on the plate. Slice carefully, noting where you’ve placed the trinkets. Don't forget to remind guests that they might find items in the bottom before everyone chows down! No one wants to have to perform the heimlick maneuver at their St. Patrick's Day party. Soda-Bread Barm Brack cooled with trinkets wrapped in wax paper and pressed into the bottom. TO MAKE YOUR OWN ST. PATRICK’S DAY BARM BRACK! In the hot tea for 2 hours, then drain and gently squeeze out excess tea. Grease a 9 inch bundt pan, or round bread tin. Stir together the flour cinnamon, nutmeg, and baking soda; set aside. Beat the egg and sugar until mostly disolved. Stir in marmalade & orange zest. Stir in tea-soaked fruit until well combined. Gently fold in the flour until just combined, then pour into the prepared Bundt pan. Bake in preheated oven for 1 hour or until the top of the cake springs back when lightly pressed. Allow to cool in the pan for 2 hours before removing. Continue to cool to room temperature on a wire rack. 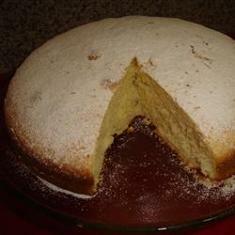 Press the objects of choice into the cake through the bottom before serving. Sieve the flour, spices and salt into a bowl, then rub in the butter. Cream the yeast with 1 teaspoon of the sugar and 1 teaspoon of the tepid milk; it should soon froth slightly. Pour the remaining tepid milk and the egg into the yeast mixture and combine with the dry ingredients and the sugar. Beat well with a wooden spoon or knead with your hand in the bowl until the batter is stiff but elastic. Fold in the dried fruit and chopped peel, cover the bowl with a damp cloth or pure clingfilm and leave in a warm place until the dough has doubled in size. Knead again for another 2-3 minutes and divide between two greased 1 lb loaf tins. Cover again and leave to rise in a warm place for about 30 minutes to 1 hour or until the dough comes up to the top of the tin. Bake in a preheated 350° oven for about 1 hour. Test with a skewer before taking out of the oven. Glaze the top with the sugar dissolved in the boiling water. Turn out to cool on a wire tray and when cold cut in thick slices and butter generously. * This Barmbrack recipe keeps well, and can be frozen... but it's unusually delicious when it's gone stale, toasted and buttered. This is a traditional Irish recipe, but it has nothing to do with Barn Brack. If you are in the mood to bake after reading this blog, and want something simple, perhaps for the morning after your celebrations, try this super-easy, traditional, any-time pastry, Irish Tea Cake. Goes well with Irish Coffee, as well as your average coffee break or tea time. In a medium bowl, cream together the butter and sugar until light and fluffy. Beat in the eggs, one at a time then stir in the vanilla. Combine the flour, baking powder and salt; stir into the batter alternately with the milk. If the batter is too stiff, a tablespoon or two of milk may be added.